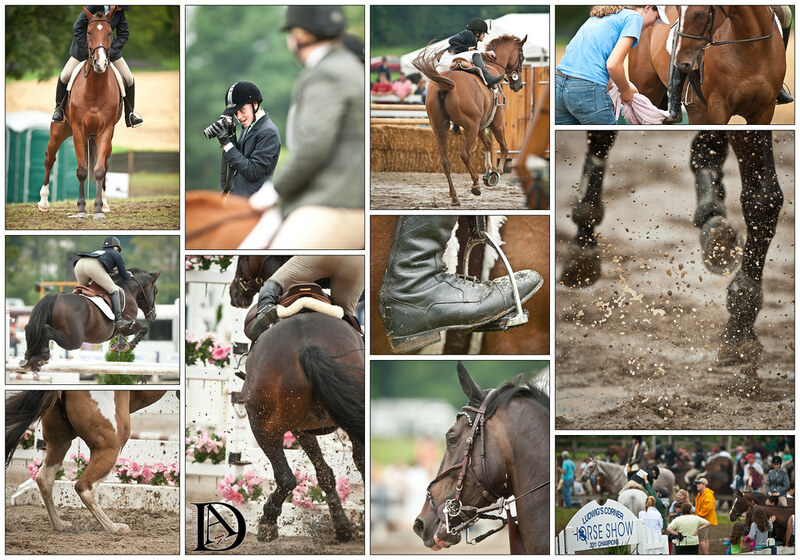 Many of my fellow equestrian photographers have been in discussion lately about the rights awarded to the official photographer at a competition, credentialed media photographers, how to deal with poachers, copyright infringers...basically all things business. While I made rookie mistakes at the beginning, once I became a member of the professional ranks I have always done my best to respect the official photographer(s). Digital has made it very easy for anyone with a camera to set up a website and sell prints. I walk both sides of the line, I have shows where I am there to sell to the participants, and I have many others that I cover as a working member of the media. My distinctions between my stock and my participant photos are 1. the location were they are hosted, 2. the access, 3. consumer product prices are only listed on images for sale from event where I am asked to be there. While I am there to cover the competition with the "standard" shots I am also there to add to my stock database. All my images will go into my stock galleries (which are password protected, and access is limited to editors and ad agencies). Here is a sample of what I am shooting in addition to the "knees to the nose" frames. Winter is always a slow time in terms of shooting. I am at the paper during the week, and I am always on the look out for equine stock, so I rarely go a day without a camera in my hand at some point. But scheduled work for my clients slows down in the cold. This week was like the first robin of spring. I am making a run to Aiken, SC next week for a training still and video shoot for Practical Horseman (and have made queries to other clients about any needs they might have), I have booked a PR job for April, I chatted with an old contact in her new job about a training DVD production, I am editing the requests for stock that flooded my in-box today, I am roughing out an idea for a self-service photo booth for my weddings, I am headed down to a friend's to help her with using my studio lights for an upcoming job she has, I need to send my credential application for Rolex Kentucky. Wait, did I say winter is slow? I, along with a huge stable of other photographers, do work for West Chester University (my alma mater, Class of '94, Go Rams!). 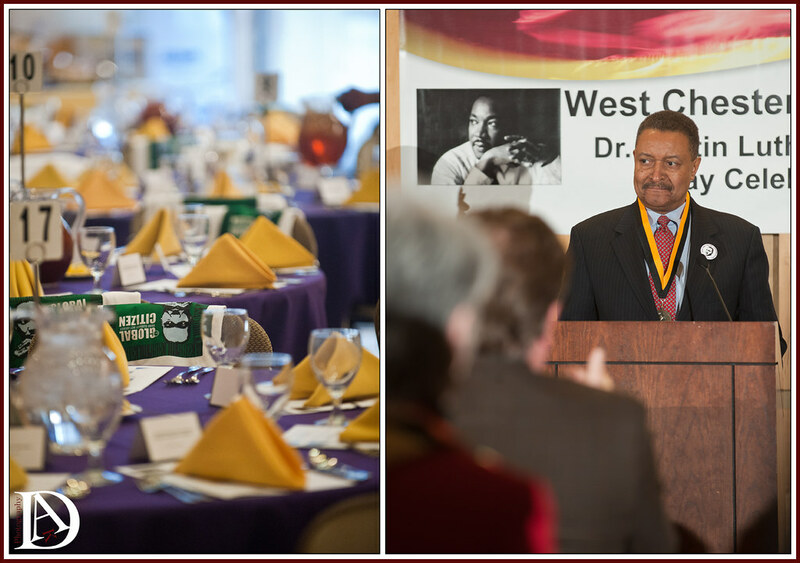 This is second year I have covered the Dr. Martin Luther King, Jr. brunch and awards for the school. Each year they honor someone with "Drum Major for Justice" award. The title Drum Major for Justice is taken from one of Dr. King’s sermons, which he gave the same year he was assassinated. This year it was awarded to Ronn Jenkins, a 1965 graduate of West Chester State College who had been aggressively recruited for his academic achievements and excellent diving skills. He went on to earn his master's degree from Bucknell University and his doctoral degree from the University of Pennsylvania. Beyond his professional attributes, Jenkins has excelled in the sport of diving. He has been nationally recognized, serving on the NCAA Swimming and Diving Committee, the National YMCA Swimming and Diving Committee and as chair of the United States Diving Committee on Diversity. In 1995 he was named the NCAA Diving Officials Coordinator for the Diving World Cup and he served in the same role at the Olympic Games in Beijing. In 2009, he was inducted into the WCU Athletic Hall of Fame. Jenkins' illustrious career has cast him as a legendary diving coach in the Greater Philadelphia region who mentored and tutored numerous All-American and championship divers from diverse backgrounds both at WCU and through the many private lessons he gave. Equally notable, he has coached the men’s and women’s diving teams as a volunteer for more than 38 years, continuing to do so even now as a retiree. I cover so many tragic, negative and angry events as a daily photographer. I admit, there is a rush in the uncertain and the challenge. Perhaps it is just me getting old and soft, but I love the human element more and more. I respect those who are unassuming and lacking in bravado. In a world where so many coaches scream and gesticulate and throw things and become the focal point (not so much in swimming and diving I know), I found myself thinking how his grace and quiet charm must contribute to his success. Everybody has a story, and I am so pleased to have had the chance to document the recognition of his. In keeping up with the quickly changing face of media I added video production and editing to my stable of offerings a few years ago. At first it was to meet the daily demands of the paper's website, but it quickly turned into videos for training, products, sales and DVDs. Here is the latest video, a tour of the products Kerrits will be offering with the 2011 line. Kerrits Spring/Summer 2011 from amy dragoo on Vimeo.